Associate Prof., & HOD, Dept of Chemisty & Chem. Tech. Head, Department of Physics & Techno Physics. Head, Department of Human Physiology with Community health. Head, Department of Botany & Forestry. Head, Department of Bio-Medical Laboratory Science and Management. Head, Department of Aquaculture Management & Technology. Head, Department of Remote Sensing & GIS. University Science Instrumentation Centre (USIC) started its journey in the year 1993, with its aim to uplift the quality of research in basic as well as applied field of science carried out by the faculty members of this University. Since 2010, centre had started functioning in a room (40’X20’) with limited infrastructure in the newly built Einstein building. Our University authority with the able leadership of our present Vice-Chancellor has taken initiative to enhance the infrastructure of the centre. Recently, two new rooms (40' X 20') have been allotted for USIC in the newly constructed first floor of Einstein building. Centre has come out from its initial bottle neck of infrastructure and fund. During XIth plan period UGC sanctioned two technical manpower and nearly Rs. 130 L for procuring sophisticated instruments & softwares for the centre. Instruments were purchased keeping in mind the need of the research fraternity of the University. So far centre possess 15 different instruments for helping cutting edge research in different field of Physical, Chemical and biological sciences. All the faculty members are highly benefitted from the service provided by the centre. At present the following instrumental facilities are provided by the USIC. 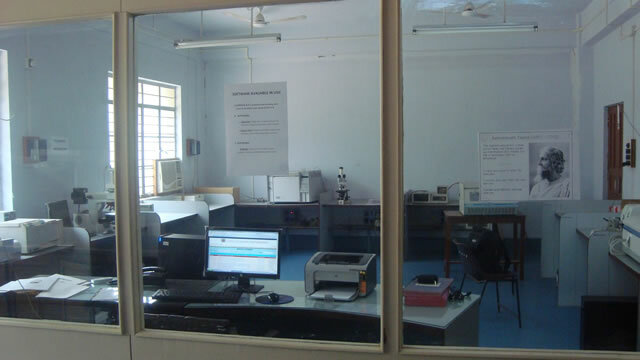 Fluorescence Spectrophotometer, Polarizing Microscope, Gel Doc XR system PC version, High Performance Liquid Chromatography (HPLC), Atomic Absorption Spectrophotometer (AAS), Cryo- microtome, Compound microscope, FTIR, Particle size & zeta potential analyzer, UV-VIS-NIR Spectrophotometer, RTPCR system, AO+ size (42 inches) wide format color scanner, ELISA Plate Reader, Water Quality Analyzer. We have a plan to procure following instruments in the near future for the centre and have placed our proposal to UGC through the XII th plan proposal of our University. SEM, TEM, Fluorescence lifetime measuring instruments, X-ray diffractometer. Meeting of USIC committee are held on regular intervals to take any major decision related to functioning and purchase of instruments of the centre. In order to provide smooth and maximum utilization of centre among the users, committee unanimously formulated the following rules. Users must be either faculty member or registered research scholar of the University. Booking of time slot prior to use of any instrument is must. Users must maintain the logbook before and after the use of a particular instrument. Prior approval of the director of USIC is essential for use of any instrument of the centre beyond office hour. 1. Canoco 4.5 in academic pack including canodraw for windows cano marge and pr cord.